Websites claiming to cater for lone parents tell me the oddest things about what I want and need. One site explained that the time I most need support is when I’m unpacking. In my world unpacking is not an issue: unpacking is the gradual deconstruction of the luggage as and when stuff is needed. What I need is a place where my children will be happy, engaged and safe and I can relax and have fun with my children and with other parents. Evenings can be the most tricky. My teenage children, like most in their age group, prefer not to have to spend every evening with me. Which can leave me, alone, at a restaurant table pretending that I love sharing a bottle of wine with my book while my children find the most hair-raising entertainment available. The best single parent holidays I’ve been on have been a mixture of couples and singles on an activity holiday where everyone plays together and eats together. That gives a chance for children, and me, to spend the evening with our own age groups after a day’s skiing/sailing/swimming together. So how can you single out a good lone parent holiday? I’ve gathered a few addresses below and I’d like to hear what you think of what's on offer. Have you sampled any of these holidays? Also, can you recommend any sites specialising in lone parent holidays? And what do you want from lone parent travel firms? Low-cost adventure holidays in UK and Europe with daily planned activities. Great for sporty families. Parents, single or otherwise, get plenty of opportunities to socialise during the activities and later. Join this club and it will put you in touch with other lone parent families who want to go on holiday. Great idea if you get the right family. For a joining fee of £7.50 you get the chance to connect with other families in the same position. Holidays range from days out in the UK to Kenyan safaris – it’s down to you to decide. A new travel company offering holidays in Austria and Croatia, specifically for lone parents and their children. The hotels booked are child friendly, and a range of children’s clubs catering for all ages are available. Activities on offer include pony trekking, torch-lit walks and farm visits. Crèches spaces are also provided. Activities for parents include Nordic walking, hiking, mountain biking and golf, or just relaxing. Guests tend to eat together and half board is usually included in the price…although I was stumped when it came to finding the actual cost of each holiday. The company offers discounts to some lone parents…and help with unpacking. This agency selects travel companies it consider to have low environmental impact. It then categorises the holidays by destination and type – including dedicated single parent holidays. At the bottom of every entry Responsible Travel explains why each respective company has been deemed ecologically responsible. Mango is a young company is run by two single parents who are now partners in both senses of the word. They have clear ideals about holidays: ‘We believe they should be for quality time with the children and so we avoid hotels with kids clubs. We have our values and that’s the advantage of running your own company: you can impose them on other people,’ says MD Jackie Lewis. She and partner, Steve Barber, have four children between them. They arrange group holidays for single parents led by a co-ordinator, usually either Steve or Jackie, and based in the UK or Europe. Fathers tend to go for the action holidays like skiing or climbing while the mothers opt for gentler option like seaside trips. This charity specialises in helping any single parent in need of a good deal, support and company. Armed forces’ wives whose husbands are away, prisoners’ wives, grandparents and many more have been making use of their low budget holidays for the last 28 years. Janice Davidson, the secretary, first came to the charity as a single mother of two. Since then she has forged cut-price deals with companies like Pontins as well as checking holiday sites to make sure single parents and their children are getting a good deal. The Adventure Company is a regular travel company specialising in adventurous worldwide trips for families with some departures reserved for single parents. Lone or otherwise you get to adventure and eat together so there’s never the sense of parental isolation so familiar to single parents. 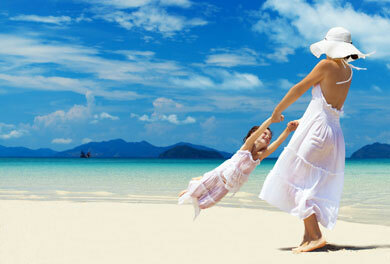 Small Families cater for single families with holidays in the UK and Europe. In fact they cater soley for single parent families with an annual party and planty of tried and tested destinations. usually based in small, family-run hotels, in the UK and abroad. Chalets encourage après ski friendliness and some Crystal chalets have discounts for single parents. This began life in 2005 when Andrea Robinson grew tired of taking her children on holiday and finding herself without any adult conversation in the evenings. They arrange holidays for exclusively for loan parents. Most are half board and most have kids clubs and various activities for parents and children non of which are compulsory. Destinations are limited to medium sized hotels. Neither Mark Warner nor Sunsail make any big claims about catering for single parents but their friendly reps and full-on activities (from skiing to tennis to sailing) make most of their holidays great for children and their parents, single or otherwise. Most guests sail/sky/play tennis in ability groups. Most guests eat together, too, making these holidays sociable events for every age group and every type of family.